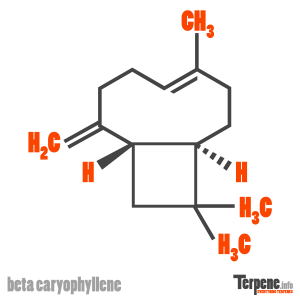 Beta-caryophyllene is a sesquiterpene, with a sweet, woody, spicy, clove-like smell. It is a unique terpene due to its large size and structure. Due to these properties, beta-caryophyllene is able to activate several receptors in the body, including CB2, which is usually activated most by CBD. beta-caryophyllene has been shown to be an effective analgesic by regulating neuroinflammation and thermal hyperalgesia. Also as an antioxidant, beta-caryophyllene is effective as demonstrated by [preventing lipid oxidation and scavenging other radicals. As and anti-inflammatory beta-caryophyllene has been proven to mediate kidney inflammation and its side effects. In addition, beta-caryophyllene has been eluted to be a gastric-protective. Read through our forum on Beta Caryophyllene below, or start your own topic. This forum contains 62 topics, and was last updated by Lillysom 1 day, 15 hours ago.